Thousands of settlers arrived in Colorado between 1858 and 1860, a period later remembered as the “pioneer years.” Scattering through the mountains, they were the first ones to open the mines, build the towns, and establish the large ranches in the valleys.2 The migration abruptly ended with the onset of the Civil War and the population remained stagnant until 1869, when the transcontinental railroad was completed.1 However, the Society restricted its membership to those who settled before January 1861, which effectively meant that the vast majority of its members arrived in the territory just prior to the war. By the time of their first banquet in 1881, traveling across the prairies had changed dramatically. 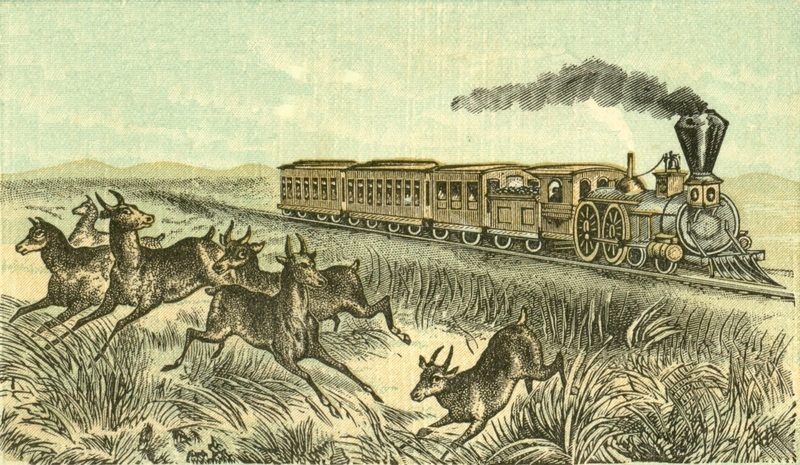 The trip was now made in the comfort of railroad sleeper cars, with many of the berths occupied by wealthy Easterners taking western vacations, arranged by the new tourist agencies in Boston. There are two bills of fare on the menu shown below. 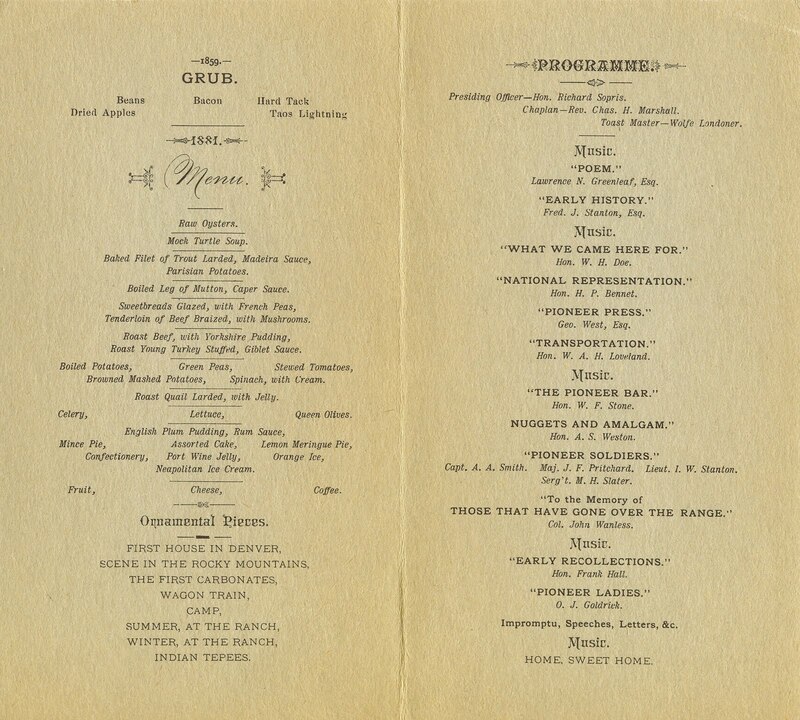 The first one is labeled “Grub—1859,” listing frontier foods like beans, bacon, dried apples, and hard tack. This menu also includes Taos lightning, a whiskey of dubious origin. 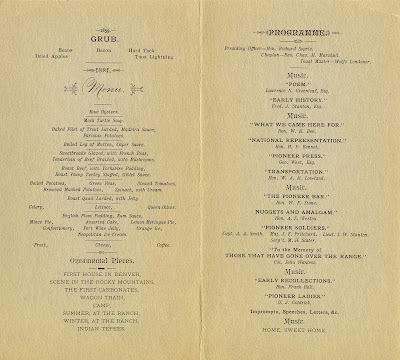 The second menu shows the actual dinner. 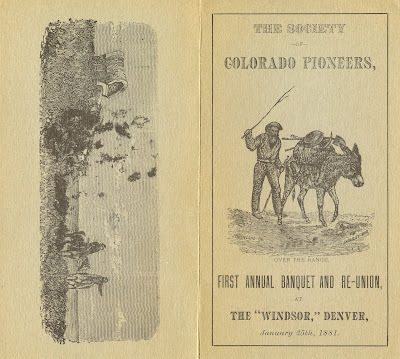 In addition to the eight ornamental pieces, featuring names like “First House in Denver,” “Summer at the Ranch,” and “Indian Teepees,” the illustrations on this menu also reflect nostalgia for the pioneer days; the one wryly titled “The ‘Sleeper’ We Came On” depicts a Conestoga wagon. The lavish banquet (shown below the “grub”) offers the typical fare then served at luxury hotels. 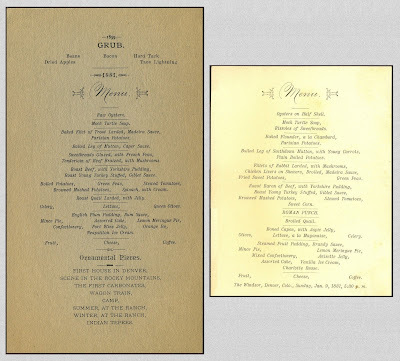 In fact, this banquet was remarkably similar to the hotel's regular table d'hote, as shown by a dinner menu from the Windsor only sixteen days earlier. 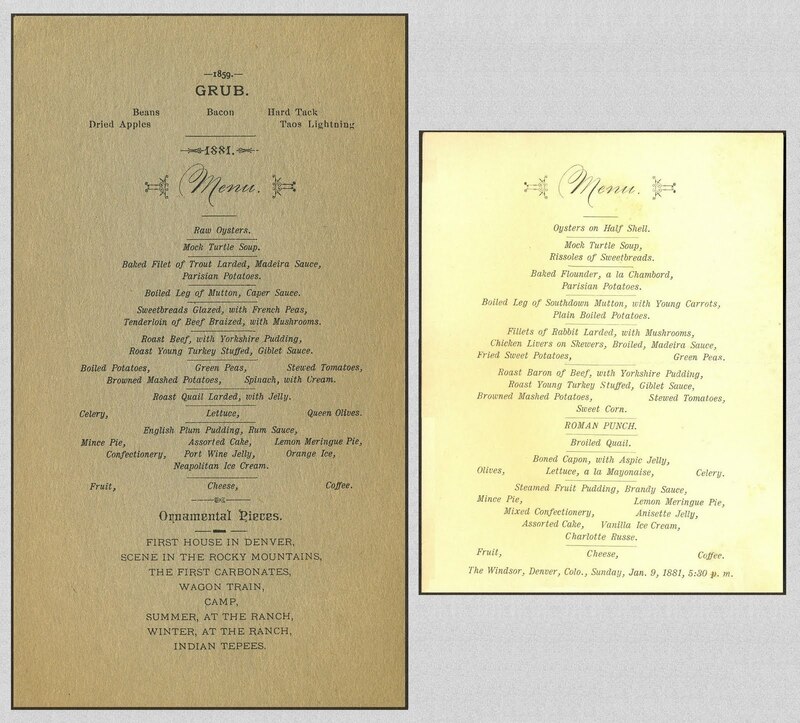 Comparing the two menus below, both meals start with raw oysters (shipped in fresh by rail each day), followed by mock turtle soup, leg of mutton, sweetbreads, roast beef with Yorkshire pudding, roast turkey, and quail. The fishes are different—baked trout for the banquet versus baked flounder for the regular dinner. However, both are served with Parisian potatoes. Although the daily menu offers a few additional choices like rabbit, chicken livers, and boned capon in aspic, the two meals are basically identical, down to the mince pie and lemon meringue pie for dessert. The routine appearance of English dishes like roast beef with Yorkshire pudding reflected the tastes of the well-to-do English ranchers in Colorado, some of whom had invested in this hotel. 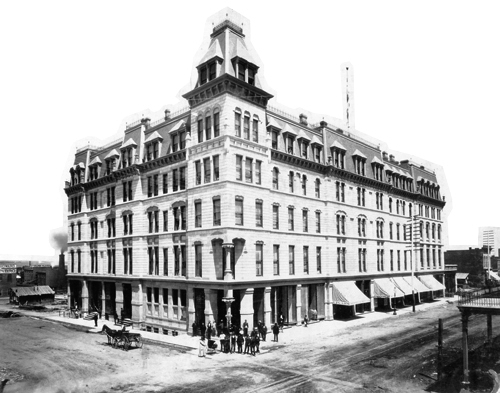 However, Denver's population of 35,000 was more diverse than Colorado Springs which called itself “Little London.” In fact, a third of Denver’s forty-eight saloons were owned by German- and Austrian-born immigrants whose patrons read German newspapers and quaffed beer in eateries with names like the Bavarian House, Germania Hall, Edelweiss, and the Heidelberg Cafe. Nevertheless, it was the English who set the city’s standards at the high end. 1. Campbell Gibson, Population of the 100 largest cities and urban places in the United States: 1790-1990, U.S. Census Bureau (June 1998). In 1860, the population of Denver was 4,749. By 1870, it was 4,759, the population of the city growing by only ten people during the decade. The population grew to 35,000 by 1880, a seven-fold increase. 2. 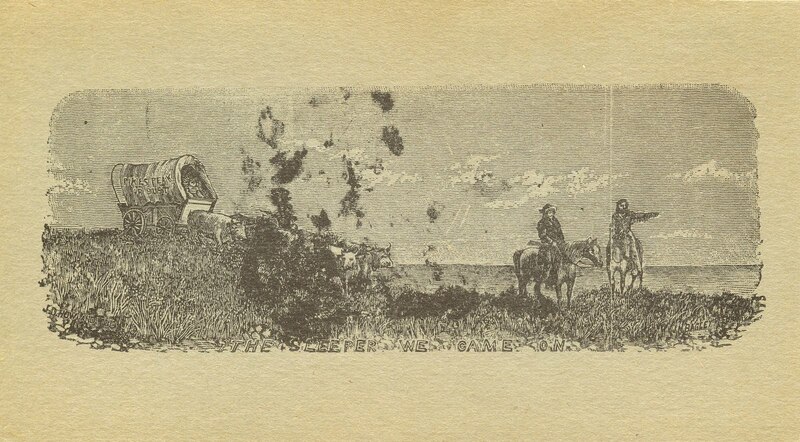 Alice Polk Hill, Colorado Pioneers in Picture and Story, 1915. 3. New York Times, 27 November 1888.
these are getting even more interesting, as you weave in the related historical facts, make comparisons between menus, etc. ... a whole picture is emerging via menus, just as you picked up on, now years ago! Thank you for a very nice historical piece. It is helpful to me, in I am writing a western where a character stays at the Windsor in July of 1881. It could be I'll change the menu I'd given her. Also helpful is the names of the German places. It is hard doing research on Denver from Germany.